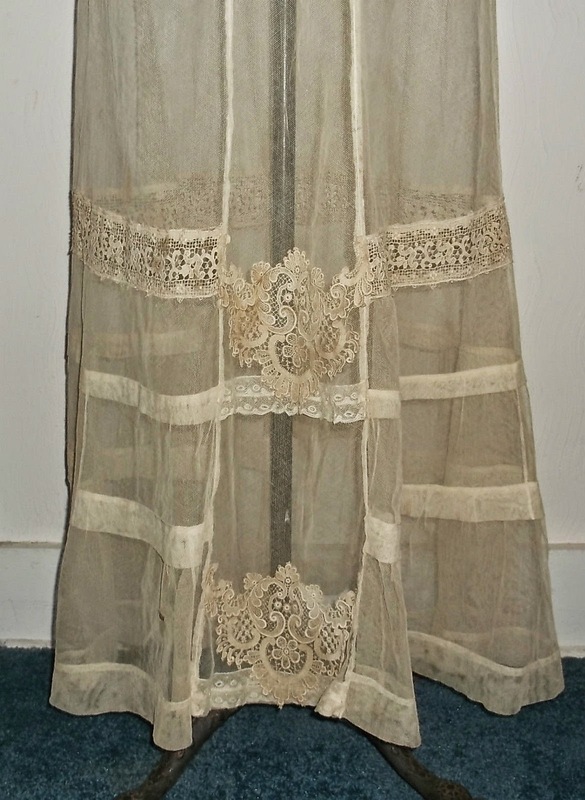 A very beautiful, original, antique Edwardian ( circa 1910) sheer netting and lace Garden Party (over) Dress. 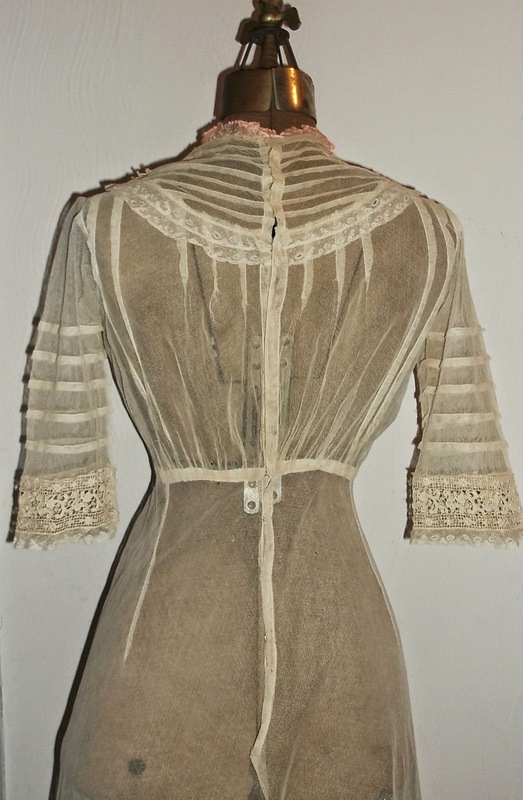 This dress originally had an underdress that was probably made of silk but it is no longer with it. 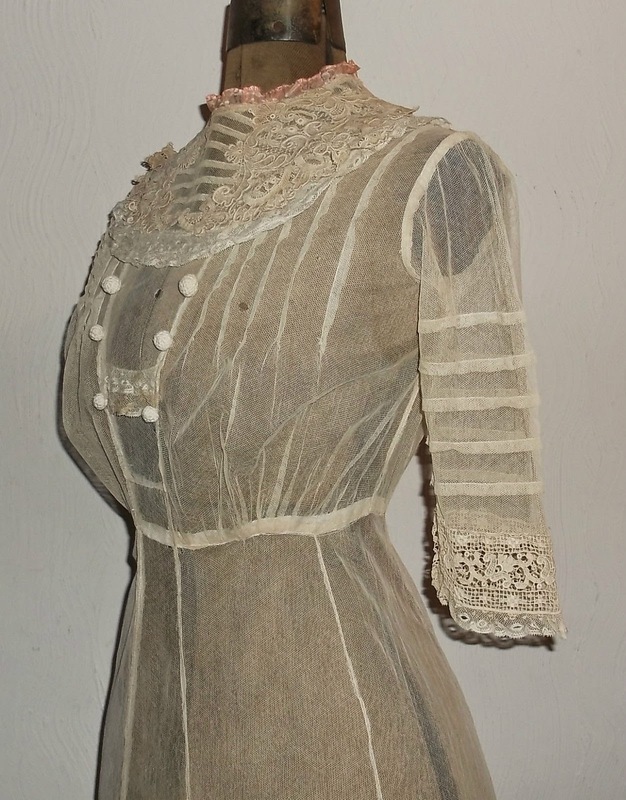 There is beautiful handmade lace around the neckline, sleeves, and at the bottom of the dress. The back has hooks and eyes (or material loops) to close it. MEASUREMENTS: (As this is a vintage item, we make no guarantees regarding fit. All measurements are approximate, and returns based on individual fit will not be accepted.) Bust: 34" around but blousy (measurement taken under arms), Waist: 24" around, Shoulders: 14" across, Sleeves: 13" long, Sleeve opening: 9" around, Bodice: 14" (measurement taken next to neck opening and down to waist band), Entire Length of Dress: 57" long (from next to neck opening at shoulder, down to bottom), Hemline: 122" around the bottom of the dress. CONDITION: There are areas of discoloration, here and there, on the netting and lace. 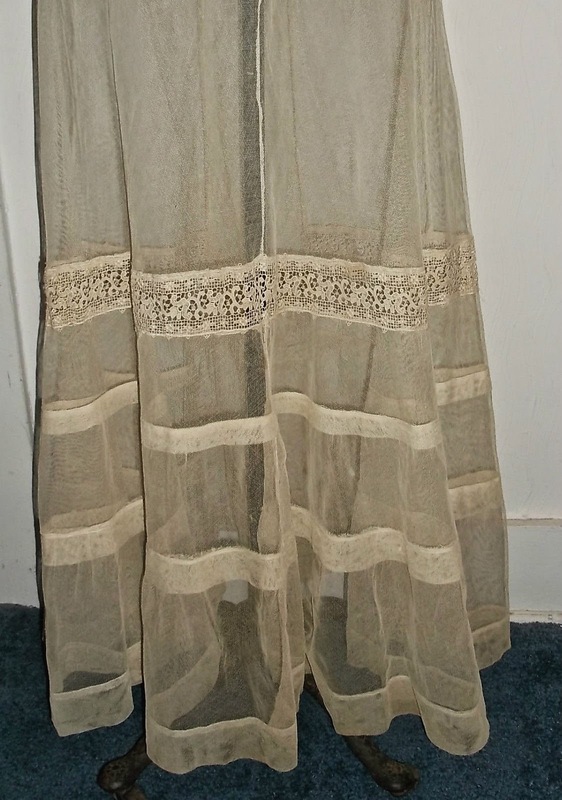 There are two holes in the netting on the front of the top, one in the bottom front of the skirt, and a couple of smaller ones that are not really noticeable (I'm sure they could all be repaired). The material still feels strong. The dark spots seen on the back are on the dress form. No other rips, or tears that I have seen. 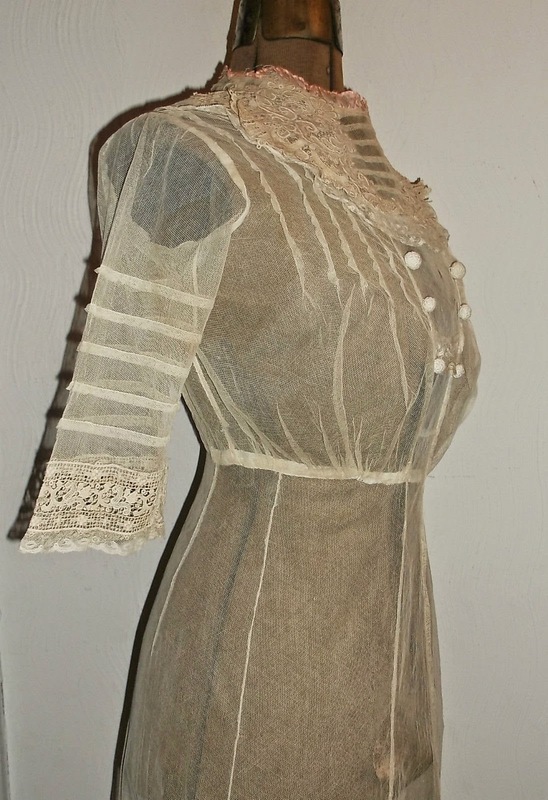 Despite the flaws, this is a gorgeous original Edwardian overdress that will look stunning when displayed. 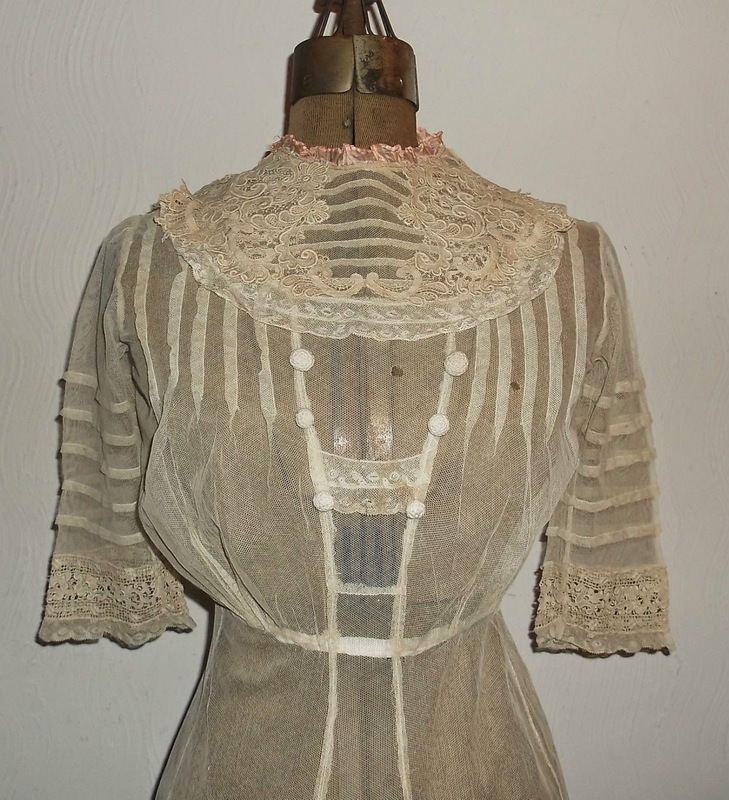 A beautiful antique Edwardian Dress to add to any collection. Being offered as is and with No Reserve. Honestly, I'd say a couple years earlier than 1910. It looks like it wants to go over an S-curve...probably about 1908.